Water recycling project, which uses reverse osmosis reject water for secondary use. This project was implemented in mid-2016 and recycled more than 300,000 gallons (1.14 million liters) of reject water in 2017. Energy management and equipment upgrades such as utilizing outdoor heat exchange systems to cool process water in winter months (rather than powered industrial chillers) and replacing outdated heating and cooling systems with energy-efficient and digitally-controlled models. Efficiency-promoting initiatives including purchasing energy-efficient lighting and vehicles, reducing packaging sizes, mileage tracking and route improvements. Data in this section associated with air emissions, releases, water use, hazardous and non-hazardous waste represents total quantities for our manufacturing, research, development, warehouses and equipment recovery/recycle operations. Data in this section associated with energy and greenhouse gas (GHG) emissions represent total quantities for our manufacturing, research, development, warehouses and equipment recovery/recycle operations, offices and data centers. Normalized values for 2014 forward have been calculated using Xerox revenue from continuing operations 1. Unless otherwise noted, all numbers represent worldwide totals (excluding Global Imaging Systems (GIS) locations) and are reported in generally accepted international units. The data presented is based on actual measurements to the extent possible. Where direct measurements are not available, we employ engineering calculations or estimates. We continue to strive to increase the accuracy of the data we report. 1On December 31, 2016, Xerox Corporation completed the Separation of its Business Process Outsourcing (BPO) business from its Document Technology and Document Outsourcing (DT/DO) business (the “Separation”). The Separation was accomplished through the transfer of the BPO business into a new legal entity, Conduent Incorporated (“Conduent”), and then distributing one hundred percent (100%) of the outstanding common stock of Conduent to Xerox Corporation stockholders (the “Distribution”). As a result of the Separation and Distribution, the BPO business is presented as discontinued operations and, as such, has been excluded from continuing operations for all periods presented. Accordingly, continuing operations represents the ongoing DT/DO business. Our major manufacturing operations have been certified to ISO 14001 since 1997. Our major worldwide technology equipment distribution centers achieved certification in 2010. Quarterly status meetings and use of an environmental performance scorecard provide visibility, best practice sharing and innovation across our operations. In 2003, we made a public commitment to reduce GHG emissions — our carbon footprint — by joining the U.S. Environmental Protection Agency (EPA) Climate Leaders program and launching our own internal Energy Challenge 2012. This 10-year initiative set a goal to reduce GHG emissions across all company operations by 10 percent by 2012. We met this target six years ahead of schedule, so we set a new target of 25 percent reduction by 2012 (from a 2002 baseline). At the conclusion of the program, we successfully cut emissions by 42 percent — that’s 210,000 tons of carbon dioxide equivalents (CO2e) — and reduced energy consumption by 31 percent. * Energy Challenge 2012 included fleet and facilities for the Technology Business. Energy Goals 2020 and 2025 encompass all parts of our continuing businesses. 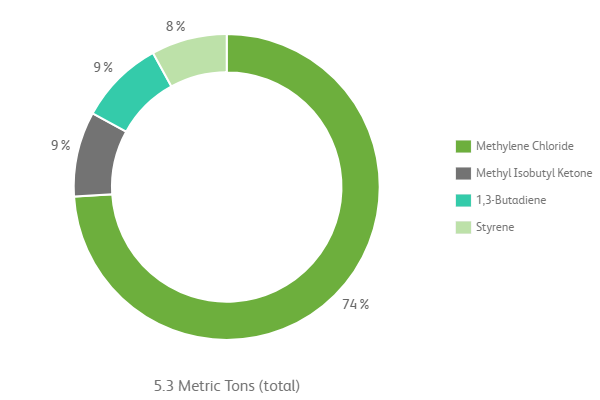 Energy totals are associated with fuel consumption by company-owned fleet and natural gas/electricity consumption in facilities. Vendor invoices from utility and fuel providers are the preferred source of data; when unavailable, estimates have been used. In accordance with the Greenhouse Gas Protocol and to make annual data comparable, we adjust the energy data each year as a result of the opening and closing of facilities and use of more appropriate emission factors that are available. Revenue is from continuing operations. In accordance with the international guidelines of the Greenhouse Gas Protocol developed by the World Resources Institute and the World Business Council for Sustainable Development, we track the six major GHGs: carbon dioxide (CO2), methane (CH4), nitrous oxide (N2O), hydrofluorocarbons (HFCs), perfluorocarbons (PFCs) and sulfur hexafluoride (SF6). As noted, we express our carbon footprint in terms of carbon dioxide equivalents (CO2e). Energy sources account for more than 99 percent of our GHG emissions. Our GHG inventory includes direct emissions from the combustion of fossil fuels, primarily natural gas, and indirect emissions from purchased electricity and steam at our manufacturing sites, offices and warehouses. The inventory also includes the combustion of gasoline and diesel fuels in our service and sales vehicle fleet. 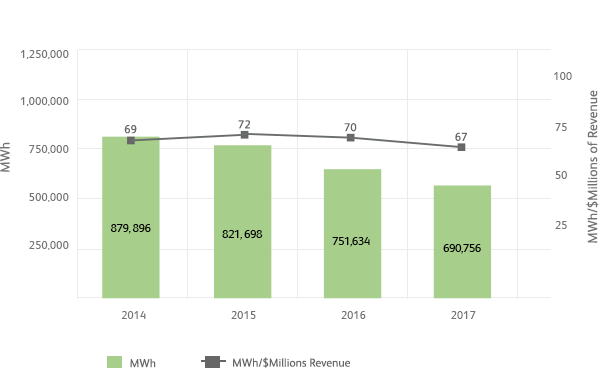 As a result of the opening and closing of facilities, changes to the fleet inventory, and availability of more appropriate emission factors, base-line adjustments are made each year, which are reflected in the Energy Consumption and GHG Emission charts. We continually strive to expand our GHG tracking of indirect, or Scope 3 emissions. We currently track Scope 3 emissions from end-of-life treatment of sold products, employee business travel, product transport, employee commute and waste generated in operations. In 2017, Xerox GHG emissions totaled 154,660 metric tons of CO2e, which is a 14 percent reduction from a 2016 baseline. About 60 percent were direct emissions from the combustion of natural gas, gasoline and diesel fuel. The remaining 40 percent of the GHG emissions total were indirect emissions from purchased electricity and steam. Xerox-owned or leased facilities, such as manufacturing sites, offices and warehouses, are associated with 53 percent of our direct GHG emissions. 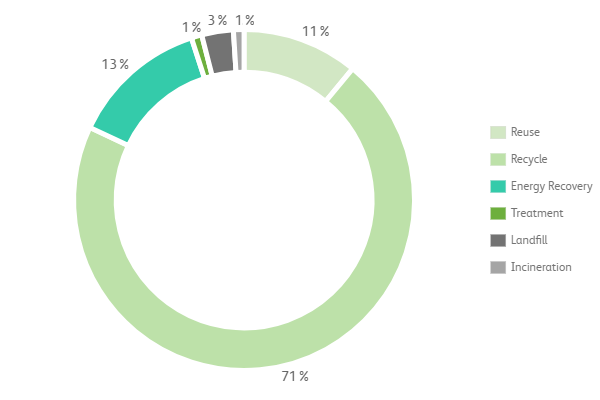 The remaining 47 percent are direct emissions from our service and sales vehicle fleet and other mobile sources. GHG emissions totals are associated with fuel consumption by company-owned fleet and natural gas/electricity consumption in facilities. Vendor invoices from utility and fuel providers are the preferred source of data; when unavailable, estimates have been used. Scope 3 emissions result from activities commissioned by Xerox, but take place at a third party and/or arise from sources not owned or controlled by Xerox. Therefore, the collection of indirect, or Scope 3, GHG emissions is challenging. The probability of data inaccuracy with Scope 3 emissions is higher than for Scope 1 or 2 emissions for several reasons. These include the limited availability of data from the supply chain and, the more tiers of suppliers there are in the system, the less transparent and more challenging the data collection process is. In order to overcome some of these challenges, we calculate Scope 3 emissions according to the Greenhouse Gas Protocol Corporate Value Chain (Scope 3) Accounting and Reporting Standard. This standard provides requirements and guidance to collect, prepare and publicly report a GHG inventory that includes indirect emissions. 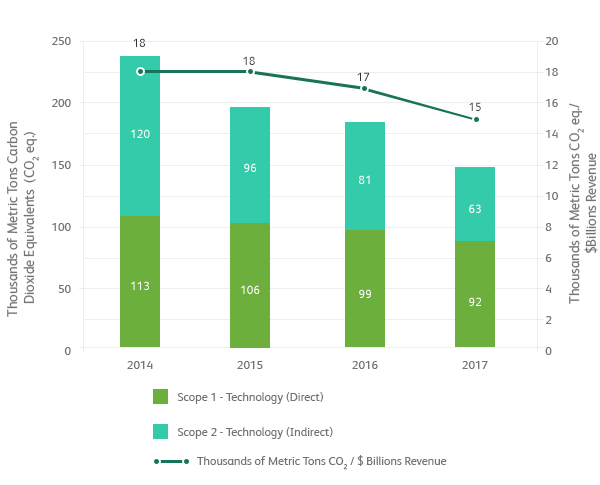 The Scope 3 emissions information is also used to prioritize our GHG emission reduction efforts and to integrate consideration of carbon impact into our sourcing and internal decision making. Our 2017 Scope 1, Scope 2 and Scope 3 GHG emissions have been verified by a third party verification/assurance company in accordance with ISO 14064-3:2006 against our internally defined methodology described in “Xerox Corporation Greenhouse Gas Emissions Inventory Management Plan, Version March 2018” and the principles of: transparency, accuracy, consistency, completeness and relevance. Xerox has examined the regulatory, physical and commercial risks and opportunities associated with climate change across our value chain. We assess and manage our carbon risk by maintaining both a comprehensive GHG emissions inventory and a mature regulatory tracking function that provides the necessary information to stay abreast of developing regulation. We do not consider our company to be subject to unique risks due to changing weather patterns, rising temperatures and sea level rise, but we recognize that our business and our customers could be affected by more frequent disruptions as a result of severe weather in locations where we operate. We may need to invoke our business continuity and resumption plans to aid customers and employees who are impacted by business disruptions on account of severe weather. We have experience working to ensure continuity of critical applications by prioritizing business needs and developing customer-specific preparedness plans where appropriate. These plans include communication with employees and customers, management of employee health and safety issues, business continuity and resumption processes, as well as interaction with government organizations. We recognize that the increasing costs of energy and concerns around energy security are issues that affect both our operations and our customers. To meet our commitment for “Reducing Energy Use and Protecting the Climate,” our long-term strategy is to continue to invest in technologies that reduce the carbon footprint of our operations and develop technology solutions that help our customers to reduce the energy and environmental impacts of their businesses. Xerox has significantly reduced manufacturing air emissions over the past 20 years, but we continue to pursue efforts to do even more. Most of our air emissions originate from the production of imaging supplies such as toner, photoreceptor drums and belts, as well as fuser rolls. Approximately 26 metric tons of volatile organic compound (VOC) process air emissions (VOC and non-VOC) were released to the atmosphere from these activities in 2017. Emission reductions over time primarily have come from process modification, lower production volumes of legacy products and production declines attributable to longer-life components. VOC air emission increases in 2017 are primarily due to increased production and revised emission factors established during stack testing at the Venray, Netherlands facility. 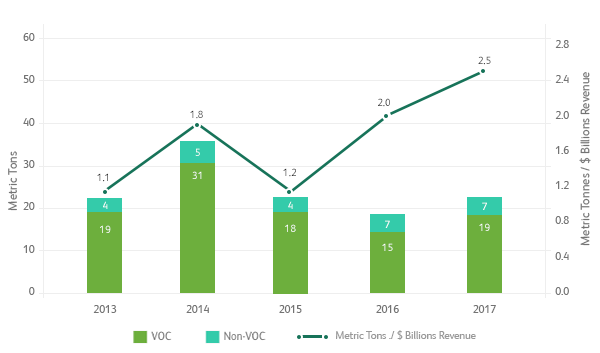 VOC Process air emissions generated in 2016 have been revised to reflect the most accurate and current data. 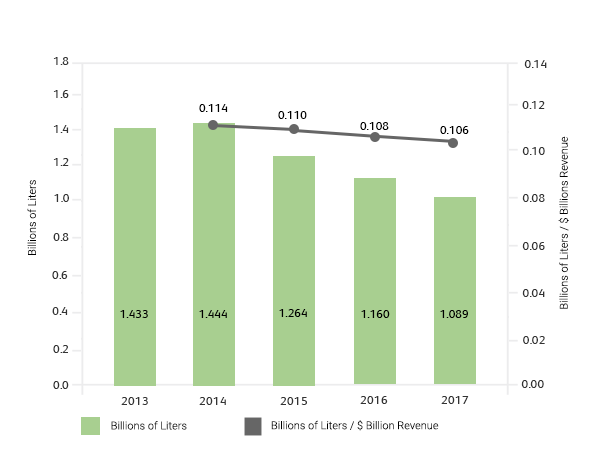 Revenue is from continuing operations. A subset of these VOC emissions is defined by the U.S. Environmental Protection Agency (EPA) as hazardous air pollutants (HAP). In 2017, Xerox reported worldwide air emissions of approximately 5.0 metric tons of HAP under national toxic chemical release regulations, including the U.S. Toxic Release Inventory (TRI) program. Methylene chloride, methyl isobutyl ketone (MIBK), 1,3-butadiene and styrene represent virtually all of these HAP emissions. Xerox policy prohibits the use of ozone-depleting substances (ODS) as ingredients in the manufacturing processes for products and finished products including spare parts, accessories, consumables and packaging. ODS used as refrigerants in facility and vehicle air conditioning systems and various food/equipment-cooling systems are in compliance with applicable global regulations. Elimination of ODS as refrigerants is managed consistent with government phase-out dates. The release of materials used in our worldwide operations is evaluated annually and reported to government agencies under national toxic chemical release reporting regulations, such as the U.S. TRI, the Canadian National Pollution Release Inventory and the European Pollutant Release and Transfer Register. 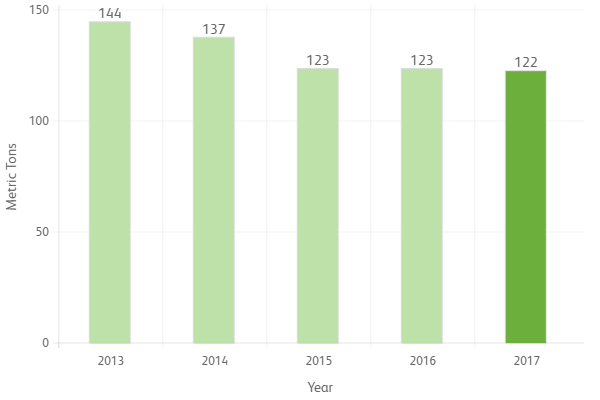 Releases for reporting year 2017 decreased slightly compared to 2016 levels and were 75 percent lower than 2007 levels. Methylene chloride used in the manufacture of Xerox photoreceptor belts has been reduced by 62 percent from the 2010 baseline, greatly overachieving the target. This dramatic decrease was primarily due to volume declines of legacy products and process modifications that cut the amount of methylene chloride used for batch cleaning of production equipment. However, there was an increase in methylene chloride usage by 29 percent from 2016 to 2017, primarily due to production scheduling issues. 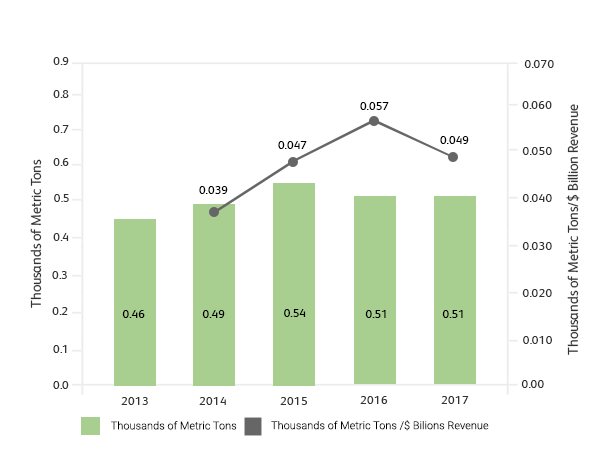 In 2017, per-batch emissions of 1,3-butadiene from U.S. toner resin manufacturing operations decreased slightly from 2016. Low-emission hose connectors installed in 2016 and incident-free material handling operations contributed to this result. Xerox has committed to establishing new goals in 2018 to reduce the release or transfer of toxic chemicals from our manufacturing operations. Our goal is to proactively prevent any accidental release of regulated materials to air, soil and water. In 2017, no spills or releases occurred at Xerox operations that presented a significant risk to human health or the environment or caused liabilities significant enough to be included in company financial reports. The few spills and releases that occurred across company operations were reported to local government agencies as required, but are not considered significant. As part of our commitment to conserve resources, we monitor water consumption across our manufacturing, distribution, and research and development facilities worldwide. Water consumed by Xerox operations is sourced from local municipal suppliers that withdraw water from the ground, lakes, rivers or other surface waters. We also strive to preserve the planet by recycling water. A program initiated in mid-2016 at our plant in Wilsonville, Oregon utilizes reverse osmosis reject water for reuse in onsite cooling towers. During 2017, more than 300,000 gallons (1.14 million liters) of reject water were reused onsite in cooling towers. The water discharges at manufacturing sites are monitored as necessary to validate compliance with local sanitary sewer discharge limits. Wastewater from manufacturing processes is treated, as necessary, before being discharged into local sanitary sewers. We utilize best practices to prevent unwanted pollutants from entering waterways via surface contamination and run-off. Extensive sampling of wastewater, discharged to both sanitary and storm sewers, ensures that discharged water meets our strict requirements. 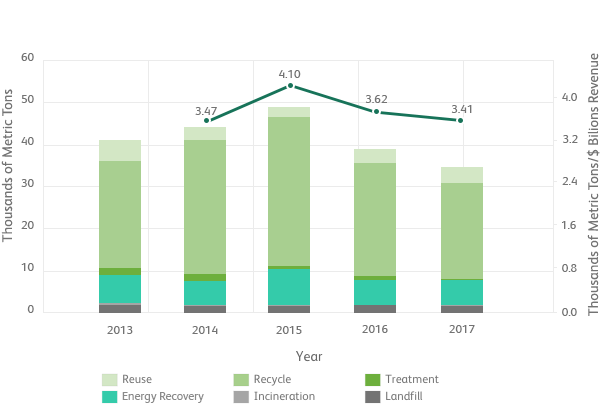 Although Xerox has not established a goal for reduction of wastewater discharges, it is worth noting that water discharged from our facilities in 2017 was approximately 43 percent lower (975 million liters) than in 2010. These results also can be attributed to water conservation initiatives, adjustments to metered discharge estimates, and production declines. Revenue is from continuing operations revised for all periods to reflect discontinued operations. Xerox has a mature program for reducing the amount of hazardous waste generated throughout the company. Historically our manufacturing operations that generate significant quantities of hazardous waste have goals and objectives to eliminate and/or reduce the amount of hazardous waste generated. Since 1999, Xerox has reduced the quantity of hazardous waste generated by almost 90 percent. These hazardous waste reduction activities have included manufacturing technology changes and re-use/recycling initiatives. Although the amount of hazardous waste generated across the company has been relatively flat in recent years (0.5 thousand tons), Xerox strives to manage these waste streams in a beneficial manner. Approximately 70 percent of the hazardous waste generated in 2017 was managed at fuels blending and solvent recycling facilities. Only 0.3 tons of hazardous waste was landfilled; all other hazardous waste generated during the year was treated and/or incinerated. Xerox does not export hazardous waste to developing nations. Hazardous waste generated in 2016 has been revised to reflect the most accurate and current data. Revenue is from continuing operations, revised for all periods to reflect discontinued operations. Values have been rounded to the nearest decimal place. Xerox has had waste reduction efforts in place for many years. We reuse boxes, pallets and containers for parts delivery. We capture and reprocess toner that is outside the acceptable size range during manufacturing, recycle returned equipment and reuse totes for recycling scrap metal and paper. Globally, operations generated 35,000 metric tons of non-hazardous solid waste in 2017, down from 39,000 metric tons in 2016. Process waste consists primarily of paper, wood, pallets, waste toner, plastics and packaging waste such as corrugated cardboard. Equipment manufacturing waste includes scrap metal, waste batteries and lamps, miscellaneous trash, and non-usable end-of-life equipment and parts that our customers return to Xerox for processing and remanufacturing. This waste made up about 72 percent of the non-hazardous solid waste managed by Xerox operations in 2017. 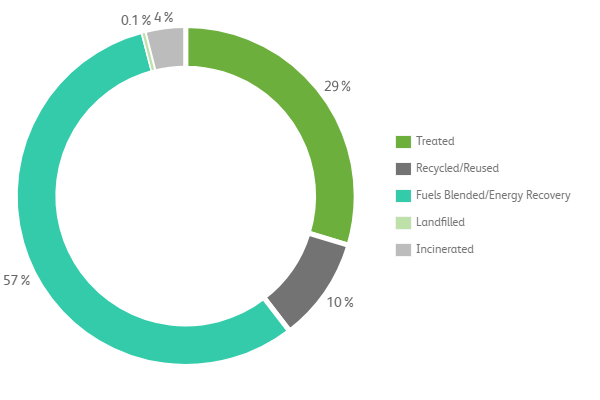 Xerox is able to reuse or recycle nearly 100 percent of the waste generated from our customer returns. Our goal is to reuse, recycle or recover energy from 100 percent of waste generated at facilities globally by 2020. 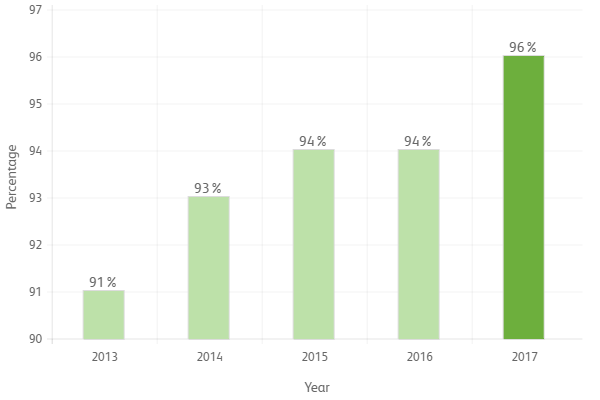 In 2017, nearly 96 percent of non-hazardous solid waste generated was reused in equipment repairs or remanufacturing, recycled, or used to produce energy, up from 94 percent in 2016. In 2017, our equipment resellers were able to return a greater number of products to the marketplace for resale. That resulted in a significant reduction of all non-hazardous waste. In 1985, we voluntarily assessed our real estate portfolio globally and identified 68 facilities that required corrective actions to address environmental contamination. We worked closely with the appropriate federal, state and local agencies to implement prompt and appropriate measures to ensure the protection of employees, neighbors and the environment. Today, only three of the original 68 sites require active remedial or control measures. Source areas of contamination have effectively been removed or greatly reduced, allowing the remediated properties to be available for reuse or redevelopment. We are conducting post-remediation compliance monitoring at one site that is no longer subject to active remediation, which will enable the regulatory process for managing this site to be completed. In addition to employing conventional techniques for groundwater recovery and treatment and soil excavation, we have a history of developing innovative technologies to enhance our remedial efforts. These include techniques that improve and accelerate the recovery of contaminants such as high-vacuum 2-Phase Extraction and enhanced bedrock fracturing. We also employ technologies where contaminants are degraded or converted to less harmful substances through enhanced natural biodegradation and chemical oxidation processes. We require our various operations and subsidiaries worldwide to report any written or verbal notices of environmental fines, citations or formal violations. In 2017, Xerox did not receive any fines, citations, or notices of violation from environmental regulatory agencies.